The Good Life Starts Here With Sauna & Steam! Healing benefits of sauna and steam have been known by cultures around the world for at least a thousand years. The physical benefits combined with the associated stress reduction makes the decision to purchase a Helo experience an easy one—it not only feels good, it’s good for you! Helo offers the safest saunas from the worlds largest and oldest sauna company established in 1919! An original, honest expression of our Finnish roots, the sauna is rich with tradition. And like all good traditions, it is as relevant today as it’s always been. Amerec is industry leader in steam solutions! 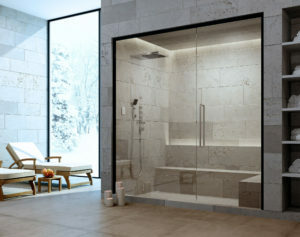 We believe in the beauty of functionality and we know how to create the perfect steam bath environment. Get ready to be purified. Both your body and your mind will love it. Helo is genuine sauna and steam. It's a position that reflects our history and Finnish roots, but it goes further. For Finns, sauna is a way of life – from early times sauna was the key room in any Finnish household. Once used for cleaning, curing illness and even delivering babies, this form of bathing has become best known for relaxing the body and mind and for providing the ultimate sense of well-being. The original Finnish sauna (sow-na) is a simple wooden building built close to a well, a lake or the sea. Inside the sauna is a wood-fired heater made of brick, stones or metal. Special stones on the top of the heater radiate healing warmth into the room, pulling in fresh air from outside. We at Amerec realize the importance of being mindful of nature’s resources. By employing modern technology, green practices, and common sense, our steam generators consume very little water and electricity compared to several other spa therapies. Using your Amerec steam bath will affect your energy bill very little. You are able to run it with very high efficiency and a minimum of wasted time, thanks to the highly programmable control panels. Our manufacturing processes are all optimized to yield a minimum of scrap and waste material. What actually comes out is being reused and recycled. 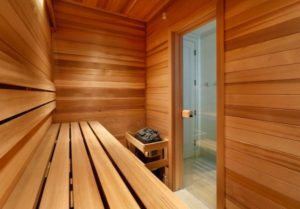 Furthermore, our sauna heater factory is ISO certified for environmentally friendly manufacturing practices and the wood we use for our saunas comes from sustainable forests of the Pacific Northwest and is from FSC certified forests.